Douglas Massel is an undergraduate student from the LU Outdoor Adventure Leadership (ADVL) Program. Potentially interested in pursuing a career as a field technician for research expeditions in remote areas, Doug added a minor in Geography to his ADVL degree, and focused on physical geography courses. In the permafrost class this year, Doug is writing his term paper on the orientation of thermokarst lakes. 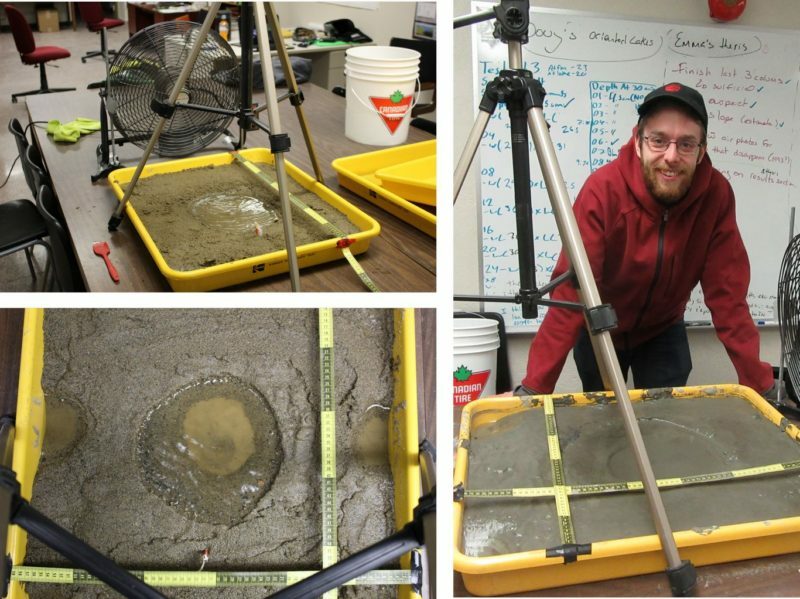 He added a scale model experiment to his paper, to examine the hypothesis that sediment texture affects the direction of lake elongation in relation to dominant winds, as proposed in Roy-Leveillee and Burn, 2015. Doug has been busy in the lab blowing wind over trays of wet sand and silt with puddles in them to look at circulation and lake expansion patterns. Doug’s scale model: wind is blowing (upper left), sediment is moving (bottom left), Doug is watching his lake expand. In summer 2017 Doug will be working as a field assistant in the Canadian NW Arctic with Chris Burn from the Carleton Permafrost Group. Best of luck Doug, and send some photos!